We have been overwhelmed by all of the data on tui sightings that our New Zealand Citizen Scientists have been sending us. Thank you all so much, and let’s keep it up! We have (finally!) managed to enter all of the data on the worksheet, and David Winter has shown us how to map the data on Google maps (still working on it!). We have also received lots of pictures of tui, which we will be sharing with all of you. 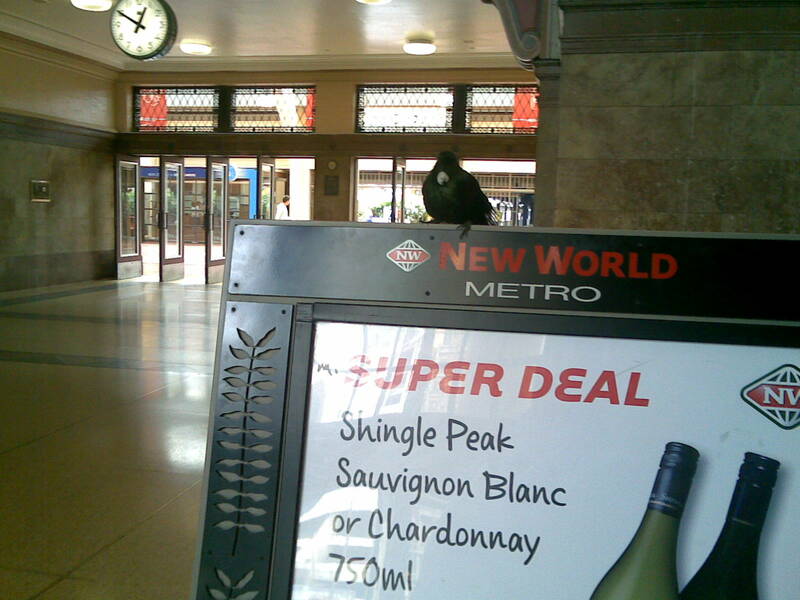 In the meantime, let me share this one provided by Chris Story of a kiwi comfortably sitting on a sign inside the Wellington train station taken sometime in November. Thank you Chris! The data you are sending us is great. We are working on trying to allow you to text us your observations. In the meantime, you can post in the comments on the Tui Project page (tab on top), email us at popscinz [at] gmail.com, or tweet @popscinz. Please remember that we need an approximate location, the date and time of our sighting, where the tui was perched and a brief description of the area. The more information you give us, the more we can learn about tui. So, keep looking and we are looking forward to more tui sightings! Friday 1st January 2010, 3:45 p.m. A tui perched high in a pecan tree, very close (though well above) the deck of our house. Address is 33 Wellington St, Papakura, a south Auckland suburban area with pockets of native bush as well as exotic trees. We have both natives and exotics on our section, which is across the street from a large park. The tui called a few times and changed branches, but flew away after about two minutes as the wind was quite strong. Thank you Terri, Looks like you and the tui share a beautiful area!